Brenda’s Catering provides catering for all occasions. We would be happy to sit down with you and customize a menu and proposal to meet any budget. Welcome to Brenda’s Catering, where every item is made from scratch with the freshest ingredients. Not only does the food look delicious but one taste and we know you’ll agree. We specialize in small dinners in your home to large celebrations, and offer everything from simple to elegant décor. In business since 1992, Brenda’s Catering is owned and operated by Brenda Smock, and centrally located 10 miles north of Mineral Wells and Weatherford. A few years ago, the business was moved from Breckenridge to Brenda’s home in the country. While in Breckenridge, she operated a catering facility that would accommodate 150 to 175 people. She was known by the locals for her noon buffets where everything was homemade. Brenda now focuses strictly on her catering and travels all over preparing her signature dishes. 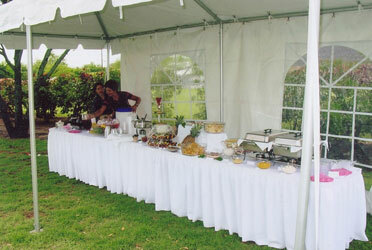 Although small in size compared to other caterers, Brenda’s Catering can handle groups from 20 people to 600 or more. Brenda has a team of great part-time employees including her daughter, Stephanie Renfro (ex floral designer) of Stephenville.